Dove body wash coupon is found on Dove’s facebook page. Click here to visit Dove’s Facebook page. The Dove goFresh body wash coupon is at the bottom of the page. After you click on the ‘Get Coupon’ link, you can print the coupon. 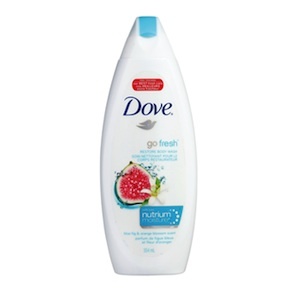 This is a Dove body wash coupon to save $2 on any Dove goFresh body wash.
Dove goFresh body wash is a perfect balance of freshness and care. The welcoming scent of blue fig and orange blossom. Inspires your sense and leaves your skin feeling restored. Infused with Dove’s unique NutriumMoisture® technology, it goes beyond refreshment to effectively nourish skin.